Very little is being written about this story in the mainstream media, which seems odd is this is a huge story of corruption in Latin America, and one that involves one of the major names in the Operação Lava Jato (Operation Car Wash) scandal that was a big factor in Dilma’s recent impeachment as Brazilian president. Following an investigation by Peruvian prosecutors the Brazilian construction firm Odebrecht have admitted to paying US$29 million in bribes between 2005 and 2014 to gain lucrative contracts. These bribes were paid during the governments of Alejandro Toledo, Alan Garcia and Ollanta Humala, which goes to show how widespread the problem is. The last of these, former President Humala and the former first lady Nadine Heredia are currently under investigation for the bribes and are banned from leaving the country. According to the Comptroller General’s Office, public work contracts signed with Odebrecht between 1988 and 2015 led to an astonishing alleged US$283-million economic loss for Peru. You can read more about the story at teleSUR. Last year I wrote an article for American Express on where to find good music in Rio de Janeiro. As well as talking about where to see samba, the article mentions the best places to dance samba, to hear tropicalia and bossa nova, as well as the best spots for dance music and alternative rock and indie. It’s a pretty good primer for getting your head around the Rio nightlife. Was just looking through some photos and found this one of my stay at the Slow Hostel in João Pessoa, a hostel I would thoroughly recommend! The popularity of Florianópolis, an island off Brazil’s southern coast, increases year upon year. Every wealthy Brazilian has a holiday home there, regular flights from Buenos Aires and Montevideo bring plenty of tourists from the more Southern countries and for many travellers heading inland from Rio it’s their last chance of a nice beach. This has led to a tripling of its population in the last 40 years and huge amounts of development on the island. Something, its basic road infrastructure has struggled to deal with – traffic jams are incessant! This has led some to question its ‘beach paradise’ status, but there is hope. Much of that development has been occurring in the North, especially in Canasveiras (full of Brazilian holiday homes) and Barra da Lagoa (a village of gringos and hostels). The South remains largely untouched, and is definitely worth investigating. Although getting a bus during rush hour could lead to you regretting ever stepping foot on the island, the bus system is actually very effective. Get on any bus and as long as you don’t leave a terminal you can go anywhere you want on the island without paying more than the very cheap initial fee. Taking a bus south will lead you to Armação, where there is accommodation, shops and a cashpoint (the last one for a while!) The Armação and Matadeiro beaches are full of Brazilian families playing frescoball, amateur fishermen with hopeful-looking sticks in their hands and the odd tourist catching some rays, but the real gem is Praia da Lagoinha da Leste, a 3 hour walk along the coast. The route is quite hilly but the view as you round the last bend of the cliff and see the beach open up in front of you is nothing short of breathtaking. It will take another half an hour to get to the beach from the top, by which time you will be ready to dive into the crystal clear water and revel in the fact that you’re most likely one of the few people to be enjoying it. Taking a further bus south from Armação leads to Costa do Dentro, the last stop. There are a few guest houses here, a hostel and a couple of shops, but little else. Well, little else except for three very charming beaches and a beautiful landscape to explore. 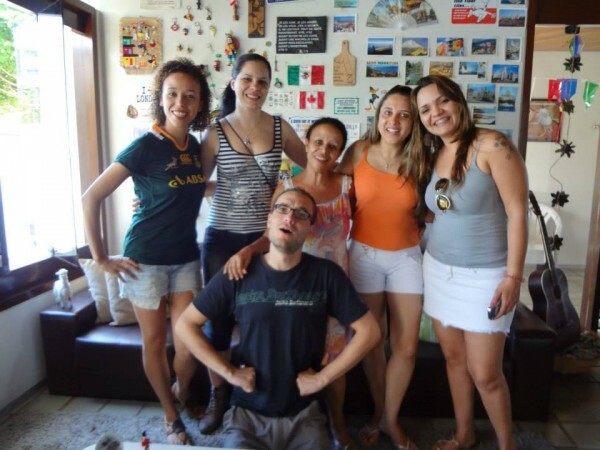 I spoke to Marcelo Piccolo, who owns Albergue do Pirata, the only hostel in Costa do Dentro. He says that “the south of the island represents what the island was like in earlier eras. It’s the area which has preserved the majority of its history and culture.” This is why the South is so alluring to me. The North may host the grander parties, with worldwide brands such as Pacha arranging club nights, but the South has the true beauty of the island at its heart. From Costa do Dentro it is possible to follow trails up into the mountains in the far Southern corner. One of these trails leads to a beach called Praia dos Naufragados, another remote stretch of sand that ticks all the boxes in the paradise stakes. As the island’s population increases the danger is that more development will occur in the South and these claims of preservation will start to become more optimistic than realistic. Marcelo certainly accepts this likelihood but is prepared to fight against it: “There are many people interested in developing on the island, obviously with financial ends. It is up to us to make sure we stop that from happening.” Considering the amount of interest currently in Brazil and the forthcoming World Cup and Rio Olympics now may just be the right time to explore of one of Brazil’s many natural splendours before it disappears. Never has Brazilian music been as funky as this. The colour and hustle of Rio de Janeiro’s streets sits alongside the tight funk of James Brown and Fela Kuti on an album increasingly being thought of as Jorge Ben’s crowning achievement. The glittering guitar work, insistent vocals and bursting melodies are the same as he’s always used but there’s a power to the band that wasn’t completely there before and a rawness which would soon be lost in the eighties. Another two songs take football as their main theme on this disc; “Meus Filhos, Meu Tesouro” and “Camisa 10 da Gavea”. It’s one of his enduring qualities that Ben has always stayed clear of songs with political intent, choosing instead to write about themes from which any Brazilian can find joy. That he’s held in the same regard as heavyweight songwriters such as Chico Buarque and Caetano Veloso is testament to how good these songs actually are. This album includes two particular songs which have gone on to become stoned-on classics. “Taj Mahal”, which had featured as an improvisational jam on his collaboration with Gilberto Gil from the previous year, was here reinvented as a disco-funk tour-de-force. Some people see this as the step that Ben made away from Samba Funk and towards Samba Disco. It is definitely true that later albums would be far more disco’d up, but this should in no way detract from this track. It is impossible to sit still as the beat kicks in on this number, before the hushed words ‘Taj Mahal’ get the ball rolling and both an irresisitible verse and chorus leave no moment of rest for the song’s entirety. “Xica da Silva” is another song which has gone on to become a staple, appearing in different guises on future Ben albums. It also brings up one of the other themes of the album, it’s African roots. I’ve tried to find out more about this record and where the African influence comes from but have failed to find anything substantial. Has Ben been to Africa? Were African musicians used on the record? After many listens I would have to suggest that the African influence comes more from the African influence within Brazil, a country which bought more slaves than any other. Xica da Silva, more commonly written as Chica da Silva or Francisca da Silva, is the name of an African slave who managed to work up the class ladder by marrying one of the wealthiest colonialists in Brazil. In some ways her story is very controversial as she kept slaves once she became wealthy but Ben chooses to concentrate on the paradigm of her being a black slave treated like loyalty, and with such a slinky, soulful groove this was perhaps the better choice. Although I’ve alluded to James Brown and Fela Kuti these are just some touchstones in terms of understanding this album because it seems to have it’s own unique flavour. On first listen I was quite adamant that I’d never heard anything like it. Even other Ben records written around this time don’t seem to quite grasp the raw funkiness of this, a funkiness which does undeniably make you think of Fela Kuti rather than any of Ben’s Brazilian contemporaries, but then at the same time the album is undeniably Brazilian. From the songs about football to the Afro-Brazilian drums and rippling samba he learnt in Rio it has to be Brazilian, but then songs such as “Cavaleiro do Cavalo Imaculado” seem to come out of nowhere and you get lost once more in this album. It has to go down as one of the greatest Brazilian albums of all time. I have no doubt about that despite only so far having a limited exposure to Brazilian music. There is put simply just some music which breaches all boundaries and exists on its own pedastal. Africa Brasil has to be one of these albums. Trancoso is thought of as something of a secret in the low-season, one for the odd visitor to come and look around. There’s no mistaking it for a secret in the high season. Every local has their own story of meeting Liam Gallagher and Robbie Williams. It is a place where many of the top DJ’s will come to play for nothing; they will do it simply to have a week partying with their friends. There is a wide range of pousadas in the quadrado and on the neighbouring square, which cater for a wide variety of people. It’s a popular spot for Brazilians to come on holidays and day trips, but it’s for the international tourists that most of these pousadas have been designed. The beautiful El Gordo with its swimming pool spanning to the far wall, giving you the feeling of floating into the ocean, while all the time only being arms length from the bar and a good cocktail (the Caipirinhas are a must). Hotel de Praça feels more casual but still offers the same level of luxury, as well as some of the friendliest workers you’re ever likely to meet, and it’s contagious. Whether you are staying at a hostel or simply there for the bar and the huge cushions that are spread around its tropical garden, you will walk out with a smile on your face. The most famous hotel in Trancoso is without doubt Uxua Casa Hotel, designed by Wilbert Das, the creative force behind the fashion brand Diesel. It’s a series of 9 guest cottages scattered around a garden of jackfruit trees. Rustic, warm exteriors hide the slick furniture and fully outfitted kitchens within. All of the guesthouses are made from local materials, many of the walls are made from mud, and this allows it to slip perfectly into the landscape of the town. Trancoso is a colourful place, with a warm people. They seem to be revelling in the extra income that has come with its status as hideaway for those in the know. Every year seems to bring new boutiques and hotels as word of mouth spreads. For anyone interested, now is definitely the time to go, and relax, and while away the days in that hammock. All those visions of lounging on a beach in Brazil with the best amenities at your fingertips can soon be realised. Staged contract killing turns into a ketchup catastrophe! This is the story of a recent case in Bahia, Brazil involving a love rival, a contract killer and a bottle of ketchup. Carlos Roberto de Jesús, a convicted felon, was given a decent pay-off in order to take care of “Lupita”, the love rival of Maria whom Maria wanted rid in order to be with her man. The only problem was Carlos was a little bit fond of Lupita, who he’d had a bit of a relationship with too, so instead of pulling off the killing as planned he decided to tell Lupita what he had been asked to do, and together they decided to stage the murder. So Carlos had Lupita lie on the floor with bandaged eyes and hands tied behind her back and then he smeared her with ketchup. Unfortunately for Carlos he didn’t get to keep the reward of 575 US dollars as he was spotted hanging around with Lupita in the town where Maria also lived! Maria went to the police claiming Carlos had stolen the 575 from her, forgetting about the mobile phone pictures, which somehow resulted in all three of them going to jail, Maria for planning a murder and Carlos and Lupita for extortion. It’s been getting some good attention in Brazil and might even sneak a mention in a Sao Paulo newspaper, but we shall see. I’ll keep you all up-to-date. Robert Wladyslaw Parzelski took a flight from London to Sao Paulo. Upon arriving he set-up camp on a concrete bench. It would be 18 days before he left. This story, which appeared in The Guardian last week, is really interesting for a number of reasons. One, because it definitely has clear echoes of Steven Spielberg’s film The Terminal (life imitating art and all that); two, because the airport really didn’t seem bothered that he was there which meant he could have stayed probably for as long as he wanted; three, and lastly, that no-one really knows what he was doing there. Parzelski could not speak Portuguese or English, which made it very hard for the airport’s cleaning staff to ask him what exactly he was doing there. So, after someone informed the paper’s of his presence, they then found a Polish doctor to speak to him. Parzelski told the man that he had been sent to Sao Paulo to pick up two specially-commissioned telephones!! Yes… telephones! And that the man he was supposed to meet never showed up. It does seem one of the strangest reasons to visit Sao Paulo, but hey, each to their own. Parzelski is now back in London after the authorities managed to get him onto a flight. You can read the story in The Guardian here. It’s now been a couple of months since I got back from Sao Paulo but I am still working on material from my time there, and this has manifested itself in a number of ways. The most exciting result from my time in Sao Paulo is the article I wrote for The Wire, which has been published in the May edition of The Wire. You can read that article here. However, as well as featuring in the print edition I also collected a number of mp3s for their website. You can listen to those mp3s here. Even more exciting though is the compilation I made for Sounds and Colours, which was released today. This features 18 tracks by artists from Sao Paulo, highlighting the truly eclectic, amazing mix happening in the city at the moment. The compilation is entitled Nossa, Cara! New Sounds of Sao Paulo and can be listened to and downloaded from here. I have also published a few interviews with singers from Sao Paulo, for both Sounds and Colours and JungleDrums. These were with Juliana R, Lulina, Blubell and Tulipa. I’ve still got a few more articles to post too so keep your eyes peeled!